Resurrection is one of those TV shows where you watch the entire season, pretty sure you have an idea what is going on, fairly certain you understand where the twists and turns are leading, and yet, even as the final scene unfolds, and you realize you really have been following along and seeing what problems season 2 will leave the characters to face, Jacob grabs hold tightly to the man who has been standing up for him all along, Agent Bellamy (played by Omar Epps) and you realize there are even more layers to this story, and yes… you do wish you had read the book The Returned by Jason Mott, because while it may not answer any of your questions, it just might give you an idea of what some even better questions to be asking. Four members of the cast of Resurrection, Omar Epps, Frances Fisher, Devin Kelley and Kurtwood Smith charmed fans at the ABC Booth during San Diego’s Comic-Con International. Barely able to see the convention hall floor, they remarked it was clear they were in the midst of an amazing event, and they were curious to see more of it, but it was equally clear to those of us lucky enough to get a chance to go down the line that while they were at that table we were the focus of their attention. And a quick moment of clarification… several fans I bumped into at CCI mentioned having really enjoyed the french version of this show, and thought perhaps it was better… sad to say, a quick tour of google tells me that while there was a French movie with a similar premise, and it is indeed evolving into a French TV show, it is NOT based on the same book, and is not the same show/story. The two have similar names, and similar story-arcs by the sounds of it… but Resurrection is based on Jason Mott’s book The Returned, and the french movie/show is not. 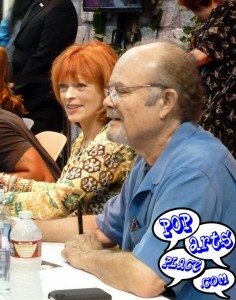 This entry was posted in Convention, Novel, Television and tagged ABC, CCI, Comic Con, Comic-Con International, Devin Kelley, Frances Fisher, Kurtwood Smith, Omar Epps, PopArtsPlace, Resurrection, San Diego, San Diego Comic-Con, SDCC, The Returned on July 26, 2014 by Kay.